I high jacked this photo from http://www.oldwestbottles.com/ check out the site and look under 'spotlight' to read the entire writeup. Everyone needs a Teakettle or two... or 27 like Jerry O'Doan pulled out of one hole in 1971. (my greenish one came from Jerry's mega-hole). 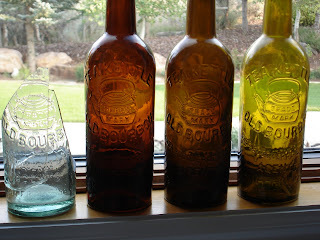 There used to be a half dozen or more for sale at every Reno bottle show in the '70s and '80s. Where did they all go? One intact aqua one exists, 3 or 4 broken examples have been found. Need a green-o-meter to rate the olive shades. A beautiful bottle, and one of the most popular and most recognizable of all the old western glob fifths. A nice pair from Lance Westfall. My small group is pretty lonely. Need a light yellow one and that real green one would help. The broken aqua one is the example that Thomas noted was found in the V.C. dump by Ann Karo. ?? Nice Teakettles ! What does the second greenest known example look like ? It's about time someone digs another GREEN or aqua example. 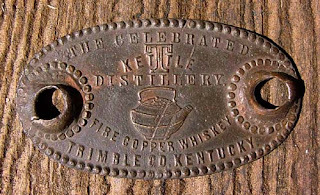 The embossed copper plate in the photo is a "Barrel tag" from the distillery and was on the barrels when they shipped them from KY to Shea, Bocqueraz, and McKee in S.F. for bottling. I have one in my collection. I also used to have the original wooden barrel lid too. isn't that repaired one now a "tool top"? SAD. No matter how you slice it, the Tea Kettle is one of the most appealing & attractive whiskies of all the Western 5ths. 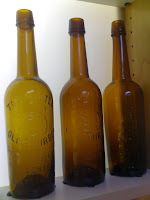 I've seen these bottles range in colors from dark chocolate amber to light green. It's interesting to note that as popular as this product was that it's distribution range was extremely limited. It's likely Shea, Bocqueraz, and McKee wanted a part of the Comstock's great wealth and made a great deal of effort to market this product expressly to the mining community. To add a little to GP's comments... If Teakettle hadnt been so successfully marketed in the Comstock, that bottle would've been ER and probably on the top 10 list. As GP correctly stated, distribution was very limited and its main target was the Comstock. From my research, the areas where the brand was marketed are quite spread out. It was also popular in Marysville, San Jose/Santa Clara, and Bakersfield. These areas have each produced at least a dozen broken or whole examples. The unique pure green example was dug in San Jose in the early 1970's. There are also probably a few other Nev. areas that are holding too that I cant recall at the moment.